Christ, they are just bound and determined to rip every last shred of pleasure out of living on this f'ing rock. Based on the tax rate I'd be paying about $200/month for service. While you were correct I misread and misspoke,is that all you have to add to the story? This is the control of information, I hope you're not as apathetic as your comment seemed. This will effect global markets and information. This is not the "control of information" any more than a store deciding not to carry books by a certain publisher is. IPs are corporations, they have provided an infrastructure and charge for the use of it, same as with any other privately owned resource or commodity. The fact that the internet has become massively pervasive into our lives is immaterial to the base argument here. The same could be said for cable TV, yet we frequently see pay-to-play in that venue... hell, two years ago we lost AMC here on GCI cable because of a dispute between AMC and the provider. Net Neutrality is a federal overreach which never should have been passed and needs to be removed ASAP. 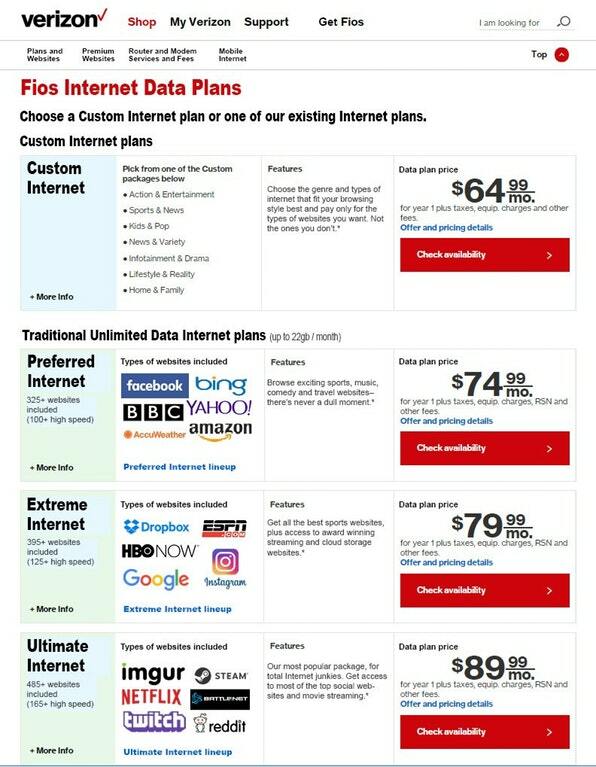 How many ISPs do you have available to you? Much of that 'private infrastructure' was funded by the government. It's not like private companies came up with the internet, anyway... that was the federal government and universities. Cable TV is a completely different animal, one where cable companies take money that they get from subscribers to buy / fund content that is then aired on cable TV. How about a more comparable example, say if electricity were billed the same way. Let's pretend you're electrical company owned electronics manufacturers that competed with electronics manufacturers owned by a competing energy company and those companies were allowed to charge you more for using electronic devices produced by their competitors. So exactly what the heavily regulated cell phone provider industry does today? We get taxed and still have limited choice... Yeah, not seeing the advantage to all that regulation. Not sure. I believe we have 1 cable, 1 DSL, plus 2 sattelite options, but could be wrong. Remember, I'm in Alaska so we're a bit behind things. It's not like private companies came up with the internet, anyway... that was the federal government and universities. ...yet we have private water companies which are locally regulated, not federally... hmm. That's not totally true. Verizon throttles my data if they think I'm burning too many gigs. I think it's a lot of crap because I'm paying a f'ing fortune for service already and I'm as low as I can get for price. That's not uncommon; in fact that's typical of many states, not just Alaska. There is not much in the way of choice to speak of. DSL is an inferior product to cable, as are satellite options. We tend to call these things monopolies, and regulate them because otherwise they get out of control, like lobbying state legislatures to restrict public broadband options. So you found a made up infographic? Cool. It's fake. Was your internet like this before? Mine wasn't. Something like this happened in real-life. Canadian mobile phone operators were completely blitzed by the fact that Skype completely bypassed their pricing plans, and attempted to impose Skype minutes to make up for the loss of revenue.